Type SJOOW Flexible Cords are designed for wiring portable tools, portable appliances, equipment, small motors, and associated machinery. Highly flexible with good tensile strength, elongation and aging characteristics. SJOOW Cords are UL® and c(UL)® listed for indoor and outdoor use. Heat-, moisture-, and oil-resistant EPDM rubber. 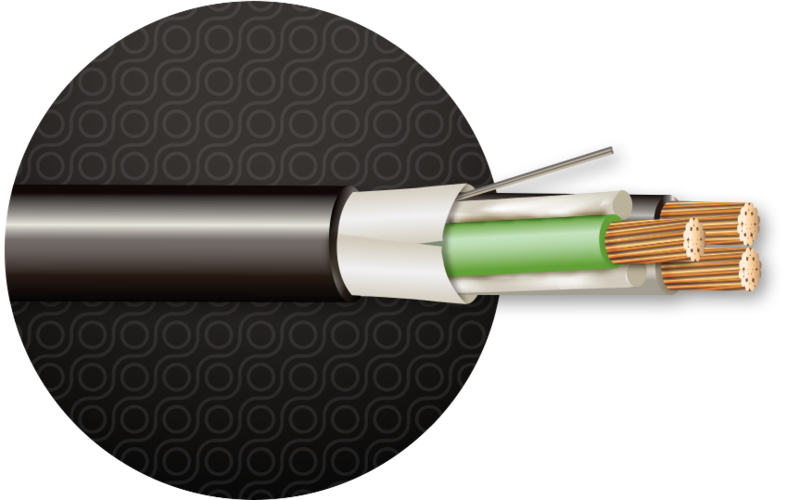 Insulated conductors are cabled with wax-paper fillers. Black or yellow heat-, moisture-, and oil-resistant flexible CPE, extruded over entire assembly. A paper wrapping beneath the jacket facilitates easy removal. Bare flexible stranded Class K copper conductors are insulated with heat-, moisture and oil-resistant EDPM rubber and then cabled with wax-paper fillers. Next, a paper separator is wrapped around the assembly for easy jacket removal. Finally, a black heat-, moisture- and oil-resistant CPE jacket is extruded over the entire assembly. Sizes 18 through 10 AWG utilize fully annealed stranded bare copper per ASTM B-174.